Genetic_DisordersOriginal Editors - Barrett Mattingly from Bellarmine University's Pathophysiology of Complex Patient Problems project. 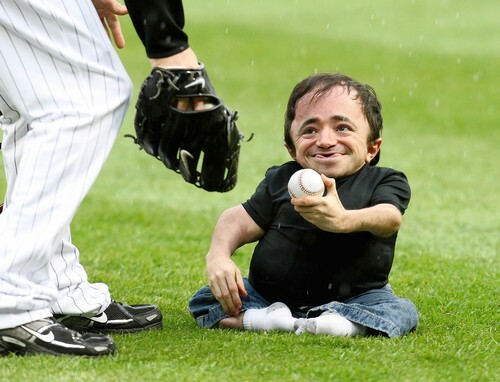 Osteogenesis imperfecta (OI) is a rare genetic disorder of the synthesis of collagen that affects bone and connective tissue that can also be referred to as brittle bone disease. OI can occur by both inheritance and spontaneous genetic mutation andhas been linked to over 150 genetic mutations that all take effect on the genes COL1A1 and COL1A2. These are the genes that make up type I collagen. The mutation can either cause collagen production that is too low, or cause abnormal polypeptide chains that are unable to properly form type I collagen. There are four primary types of osteogenesis imperfecta that are described by the Sillence Classification of Osteogenesis Imperfecta. Light or normal sclerae; may or may not have moderately short stature and joint hyperextensibility"
Below is a documentary from the Discovery Channel titled "Children of Glass" courtesy of Youtube.com. Currently it is estimated that there are around 30,000 to 50,000 people in the United States living with osteogenesis imperfecta. 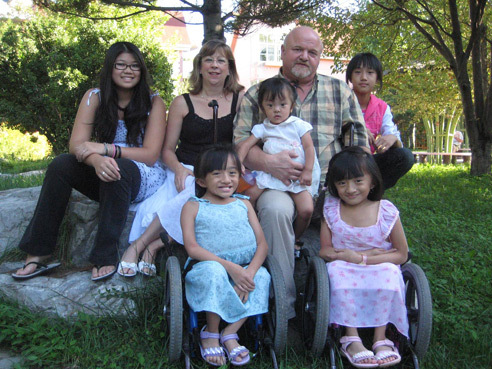 The majority of kids with osteogenesis imperfecta inherit the genetic mutation from one of their parents. A parent that carries the OI genetic mutation has a 50% chance of passing this defect to their children. Around 25% fall in the category of children who have had spontaneous gene mutation leading to the diagnosis of OI. Osteogenesis imperfecta type I is the most common and has been found to be the type for around 50% of the people that have OI. The incidence for OI in the United States is about 1 in 20,000 people and around 6 to 7 in 100,000 people worldwide. Due to the different classifications, a patient with osteogenesis imperfecta can present anywhere from appearing normal with fractures that occur occasionally, to someone very small in stature with deformities to both the spine and long bones throughout the body. The clinical presentation of patients with OI is easier to picture when broken down into the four primary classifications. Due to only 50% of the collagen being produced, the patient's bones are predisposed to fracture. Most fractures in this classification occur before the child reaches puberty. Due to only 20% of the normal amount of collagen being produced due to malformation, this is the most severe type of OI. Usually results in stillbirth or death occurring in the early years of childhood. There have been a few people with type II OI that have survived into young adulthood. Micromelia: long bones that are crumpled and bowed; ribs beaded"
Usually wheelchair bound by teenage years"
The following medications have been not been proven be effective for OI in controlled trials. Growth Hormone - This is used to improve bone metabolism and to improve growth for statural purposes. Bisphosphonates - These are used to "promote bone mineral accretion while at the same time reducing bone turnover." 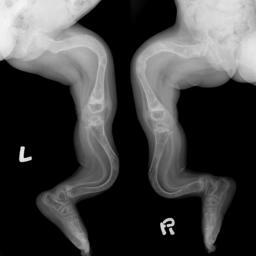 The diagnosis of osteogenesis imperfecta generally begins with the physician's findings during an examination. Physicians may find evidence of skeletal deformities accompanied by multiple past fractures that have healed using x-rays or bone scans. Wormian bodies, which are irregularly shaped islands of bone found in the wide sutures on skull radiographs of patients with OI, may also be present. Other ways to help confirm the diagnosis of OI include a history of osteogenesis imperfecta in the family, a skin biopsy, DNA testing, and ultrasound imaging before the child is born. Although OI is not always passed down from the parents, this would help the physician come to a conclusion because if one of the parents have OI, they have a 50% chance of passing this along to their child. A skin biopsy is used to determine if there is enough type I collagen or if the collagen is abnormal. DNA testing is accomplished by means of a blood test that is examined to locate the genetic mutation. Ultrasound imaging can be used to help diagnose OI before the child is born. The more severe the type of OI, the earlier ultrasound imaging can detect the fractures and deformities. By 14-16 weeks, type II OI is usually possible to diagnose. Type III OI is possible to diagnose around 16-18 weeks gestation. Types I and IV are generally not diagnosed with ultrasound. Osteogenesis imperfecta is a genetic disorder that can be caused by inheritance from a parent with OI, or a random genetic mutation. The genetic disorder in most cases is passed from one of the parents to the child through autosomal dominant inheritance. This means that one copy of the mutated gene in each cell is enough to cause the osteogenesis imperfecta. This type of inheritance is usually the cause for most people with type I or type IV OI. Random mutation of the COL1A1 or COL1A2 gene may also occur. These children have no family history of OI and tend to have either type II or type III osteogenesis imperfecta, which are more serious. The least common way that osteogenesis imperfecta is caused by autosomal recessive inheritance. This is when each cell has two copies of the mutated gene. This cause occurs by two people that are carriers of the mutated gene passing one copy each to a child. This cause usually results in a child with type III OI. Constipation that may be caused due to pelvic asymetry in more serious forms of OI. Difficulties swallowing solid foods in more serious forms of OI. Heart valve problems such as aortic valve insufficiency, aortic aneurysm, mitral valve regurgitation, and mitral valve prolapse. Restrictive pulmonary disorder is common in people with severe forms of OI. Pulmonary complications due to rib fractures, weakness of the muscles in the chest wall, chronic bronchitis, pneumonia, asthma and heart valve disorders. Basilar invagination of the base of the skull may occur in OI patients in the adult years and cause complications with the brain stem. Kidney stones have at times been associated with osteogenesis imperfecta. Patients with OI may have thin skin. Excessive diaphoresis may be apparent. Hearing loss/impairment is a common occurence in patients with OI. This can occur from deformity of the bony auditory structures. This can also be caused by a fracture of the stapes bone. Sclera may be blue, purple, or grey tinted. "It is a myth that patients with osteogenesis imperfecta feel less pain than patients without OI." The current best evidence for the medical management of osteogenesis imperfecta can depend on the form of OI and the severity its effect has been on the patient. With multiple fractures to long bones causing deformity of the bones, it can be impossible in some patients to achieve any weight bearing for ambulation. To best help with the gross deformation of the structure of long bones there is a surgical intervention that is called rodding. This procedure is most often performed in the femurs and tibiae. Rodding consist of realigning the long bone and inserting an intermedullary metal rod. This will promote the bone to hear to appear more like a normally shaped long bone and will improve the chances of the child to be able to functionally bear weight and improve chances of self ambulation. Rodding does not help to improve the fragility of the long bones and further medical treatment is still needed. Bisphosphonates such as Pamidronate are used to decrease the amount of bone resorption. Studies have found that children with OI that are given Pamidronate intravenously every one to four months have shown decreases in bone pain, an increased sense of well being, and rise in vertebral bone mass. It has been found that the child's vertebrae can regain a normal shape and size. Studies found that these Pamidronate infusions lead to a significant decrease in fractures and can improve a person's functional mobility. The uses of other bisphosphonates, such as Alendronate and Olpadronate, have also shown to make some improvements. There is not much evidence supporting the use of one bisphosphonate over another, but intravenous Pamidronate has been the one to show the most improvement with bone pain. Studies have also found that the use of bisphosphonates can impede the healing of osteotomy sites from the procedure of rodding. Bisphosphonates are not a cure for OI but need to be used in addition to physical therapy and orthopedic care. With research continuing in the areas of allogenic bone marrow transplantation there has been positive findings showing increased bone mineral content and new bone formation. There is also research being done in the area of gene therapy. Physical therapy management for osteogenesis imperfecta can help prevent disuse atrophy of muscle and disuse loss of bone mass. It has also been found that physical therapy can strengthen muscles and even increase bone density in patients with OI. Physical therapy may also help cardiovascular fitness, mental alertness, improved sleep, weight control, ability to fight infection, decrease the chance of certain cancers, and improve activities of daily living. Physical therapy should begin as soon as the child begins to show signs of muscular weakness or motor skills are being accomplished later than other children of the same age. Physical therapy intervention should include light resistance exercises to strengthen the hips and the core. A combination of hip extension, hip abduction, spinal musculature strengthening, and an aquatic exercise program twice a week has been found to increase the patient's ability to achieve an upright position and ambulate. Positioning is important in the care of children with OI. Neutral positioning of the head, trunk, and extremities with the hips in extension is the correct positioning. In more severe cases the prone position should be avoided. Physical therapy management may also include the selection and adaptation of ambulation devices that are safe and beneficial to the patients. Adaptive equipment, even powered wheelchairs, may be essential for the child to have as much independence as possible. Many resources have stated the importance of nutrition for patients with osteogenesis imperfecta. Patients with OI need to get adequate amounts of calcium, vitamin D, and vitamin C. Calcium is needed to develop peak bone mass and help prevent bone loss. Vitamin D is responsible for helping the body to absorb calcium and may also be involved proper functioning of the immune system. Low levels of Vitamin D may also have a role in chronic pain. Vitamin C is involved in the production of healthy connective tissues, and assists in the healing of wounds and fractures which is very important for patients with OI. Calcium is found in dairy products and other foods such as broccoli, kale, dried beans, nuts, and soy products. Vitamin D is mainly absorbed from sunlight through the skin but can also be found in fortified foods and dietary supplements. Vitamin C is found in many fruits and Vegetables such as citrus fruits, cantaloupe, strawberries, sweet potatoes, tomatoes, and bell peppers. The differential diagnosis for osteogenesis imperfecta can be grouped into stages of life that the differential diagnoses occur. Milder forms of osteogenesis imperfecta may not be diagnosed early and can often be mistaken for child abuse by physicians. Yochum TR, Kulbaba S, Seibert RE. Osteogenesis Imperfecta in a Weightlifter. Journal of Manipulative and Physiological Therapeutics; 25: 334-339. 2002. Strevel EL, Adachi JD, Papaioannou A, McNamara M. Case Report: Osteogenesis Imperfecta Elusive Cause of Fractures. Canadian Family Physician; 51: 1655-1657.2005. Iwamoto J, Takeda T, Sato Y. 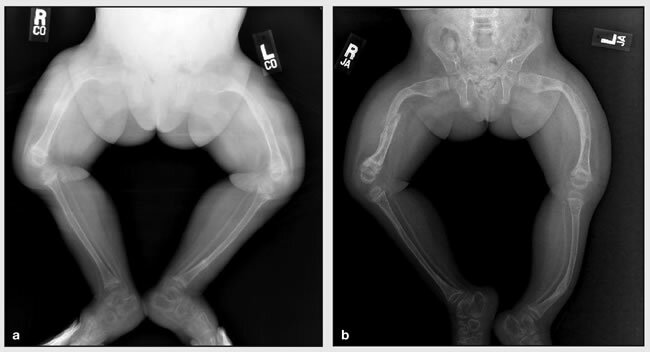 Effect of Treatment With Alendronate in Osteogenesis Imperfecta Type I: A Case Report. The Keio Journal of Medicine; 53 (4): 251–255. 2004. Aoki T, Kuraoka S, Ohtani S, Kuroda Y. Aortic Valve Replacement in a Woman with Osteogenesis Imperfecta. Annals of Thoracic and Cardiovascular Surgery; 8(1): 51-53. 2002. ↑ 1.00 1.01 1.02 1.03 1.04 1.05 1.06 1.07 1.08 1.09 1.10 1.11 1.12 1.13 1.14 1.15 1.16 1.17 Goodman CC, Fuller KS. Pathology: Implications for the Physical Therapist. 3rd edition. St. Louis, Missouri: Saunders Elsevier, 2009. ↑ 2.0 2.1 Kennedy Krieger Institute. About Osteogenesis Imperfecta. http://www.osteogenesisimperfecta.org/about-osteogenesis-imperfecta.php. Website updated: 2010. Website accessed: March 1, 2010. ↑ 3.0 3.1 National Institute of Health. Genetics Home Reference - Osteogenesis Imperfecta. http://ghr.nlm.nih.gov/condition=osteogenesisimperfecta. Website updated: 2007. Website accessed: March 2, 2010. ↑ 4.0 4.1 4.2 4.3 4.4 Osteogenesis Imperfecta Foundation. OI: Guide for Medical Professionals, Individuals, and Families. http://www.oif.org/site/PageServer?pagename=Guidefor. Website updated: 1999. Website accessed: March 1, 2010. ↑ 5.0 5.1 Antoniazzi F, Mottes M, Franschini P, Brunelli PC, Tato L. Osteogenesis Imperfecta Practical Treatment Guidelines. Paediatr Drugs; 2(6): 465-488. 2000. ↑ 6.0 6.1 Osteogenesis Imperfecta Foundation. OI Issues: Nutrion. http://www.oif.org/site/PageServer?pagename=Nutrition. Website updated: 2007. Website accessed: April 5, 2010. ↑ 7.0 7.1 7.2 National Institute of Arthritis and Musculoskeletal and Skin Diseases. Osteogenesis Imperfecta: A Guide for Nurses. http://www.niams.nih.gov/Health_Info/Bone/Osteogenesis_Imperfecta/nurses_guide.asp#PTOT. Website updated: 2005. Website accessed: April 4, 2010. ↑ ALbahnasawy L, Kishore A, O’Reilly BF. Results of stapes surgery on patients with osteogenesis imperfecta. Clin. Otolarygol; 26: 473-476. 2001. ↑ Francis GH. Treatment of Osteogenesis Imperfecta: Who, Why, What?. Hormone Research; 68(5):8-11. 2007. ↑ National Institute of Arthritis and Musculoskeletal and Skin Diseases. Exercise and Activity: Key Elements in the Management of OI. http://www.niams.nih.gov/Health_Info/Bone/Osteogenesis_Imperfecta/exercise_activity.asp. Website updated: 2009. Website accessed: April 5, 2010. ↑ Emedicine. Osteogenesis Imperfecta: Differential Diagnosis & Workup. http://emedicine.medscape.com/article/1256726-diagnosis. Website updated: 2008. Website accessed: April 5, 2010. ↑ Gahagan S, Rimsza ME. Child Abuse or Osteogenesis Imperfecta: How Can We Tell?. Journal of Pediatrics; 88(5): 987-992. 1991.